Cooking this meal low and slow allows the coffee and brown sugar to season the roast while creating a creamy, flavorful sauce. In a small bowl, stir together brown sugar, espresso powder, rosemary, salt, pepper and 2 cloves (10 grams) minced garlic. Spread spice mixture over roast. Let roast stand at room temperature for 1 hour. Set the Multi-Function Cooker to Sauté/Sear Mode, HIGH. Press Start. Add oil. Once oil is shimmering, add roast. Cook until browned, about 3 to 4 minutes per side. Remove roast from the Multi-Function Cooker. Add 1½ cups (355 milliliters) wine to the Multi-Function Cooker. Cook until wine is reduced to ½ cup (118 milliliters), about 8 minutes. Arrange onions and whole garlic cloves in bottom of the Multi-Function Cooker. Place roast over onion mixture. Set the Multi-Function Cooker to Slow Cook Program One, LOW. Insert the probe in the thickest portion of the roast. Set the probe temperature to 135°F (57°C). Cover and press Start. When roast reaches 135°F (57°C), remove from the Multi-Function Cooker. Cover and let rest while preparing the sauce. 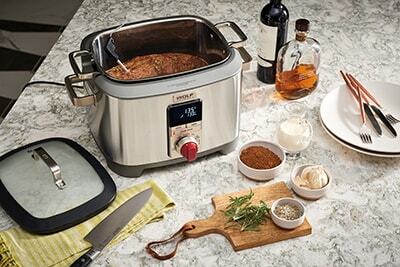 Strain drippings in the Multi-Function Cooker into a medium bowl, discarding solids. Set the Multi-Function Cooker to Sauté/Sear Mode, HIGH. Press Start. Return the drippings to the Multi-Function Cooker. Add broth, bourbon and remaining ½ cup (118 milliliters) wine. Cook until the mixture is reduced to 1½ cups (355 milliliters). Stir in cream and mustard. Cook until the sauce is slightly thickened, about 5 minutes. Thinly slice roast, and serve with sauce.